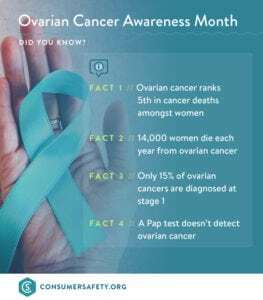 September is Ovarian Cancer Awareness Month, and Great Care takes special time to help build awareness around this heartbreaking women’s health issue. It is estimated that ovarian cancer will be the cause of approximately 14,070 deaths in the U.S. this year alone. According to the American Cancer Society, there will be approximately 22,240 new cases of ovarian cancer diagnosed in 2018. Although ovarian cancer accounts for just 2.5% of all female cancer cases, says the Society, 5% of cancer deaths are attributed to ovarian cancer because of the disease’s low survival rate. One promising aspect of ovarian cancer is that understanding of the disease has evolved rapidly in recent years, reports researchers. Growing awareness, elevated advocacy, and proactive measures toward early diagnosis can help save lives. Especially for those women screened in their 40s, 50s, and 60s, common age groups for diagnosis. The American Cancer Society estimates that about half of all cases occur in women over the age of 63. An ovarian cancer diagnosis can be stressful. For those seeking support when being diagnosed or during cancer treatment, contact the American Cancer Society at 1-800-227-2345. A cancer information specialist can offer help in receiving a wig, finding a ride to treatment, and other needs. Also visit https://www.cancer.org/cancer/ovarian-cancer.html for more information about ovarian cancer. Learn about causes, risk factors, prevention, treatment, and more.